This book is an encouraging read. First I’ll say what it’s not: it’s not a How to Save Seeds Manual. So, what is it? 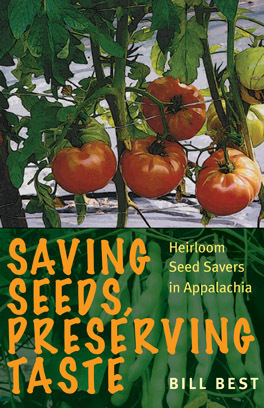 A local history of seed saving and the people involved in the Southern Appalachian Mountains of Kentucky, Tennessee and North Carolina mainly, and some of South Carolina, Virginia, West Virginia, Ohio, Georgia and Alabama. It’s about the whole traditional culture of trading and co-operation among mountain people who don’t buy all their seeds from a catalog. 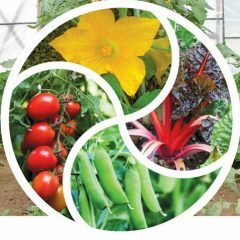 These people cultivate varieties that grow well and taste good, and they select for desirable traits to develop better varieties. Bill Best spent 40 years teaching and administering at Berea College, Kentucky. In his retirement he directs the Sustainable Mountain Agriculture Center near Berea, and gathers and passes on heirloom seeds. The author holds a Best Family Farm one-day seed swap each year in October. As a market farmer in the Berea area, Bill was featured in an article about heirloom beans and tomatoes. This led to 86 letters in 6 months from people wanting heirloom vegetables! Bill became a focus for developing a seed bank of local heirloom beans (and other vegetables). Every bag of seed came with a story! Here we get the stories as well as careful descriptions of the many types of bean. The first third of the book is about beans, which reflects the importance of growing supplies of protein and flavor when independent from stores. I’ve long puzzled about the various terms used for beans, and I am grateful to Bill Best for his lexicon. If you too are confused about greasy beans, cut-shorts, half-runners, and leather britches, then I recommend his clear descriptions. Lovers of heirloom beans tend to prefer pole beans for flavor over bush beans. Heirloom greasy beans (named for the slick shells, and famed for the tenderness and flavor) command a much higher price at markets than commercially grown beans. Cornfield beans are pole beans, traditionally grown with corn as the poles. Cut-short beans are varieties where the bean “outgrows’ the shell, so the beans are cramped into square shapes. They have high protein content. Field peas are southern peas or cowpeas originating in the Deep South. Crowder peas are the pea equivalent of cut-short beans. Butter beans are small speckled limas. Full beans (when the seed is fully mature) – is the traditional stage for harvesting beans whether to be used fresh, canned, pickled or dried as “leather britches” or shelled out. Leather britches (aka shuck beans) are full beans broken into lengths, strung up and dried in the shell, to provide meals in winter and early spring. 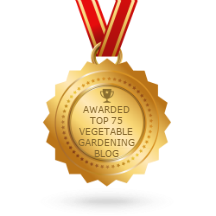 Beans with immature seeds were not much eaten – why not wait for the protein? Shelly beans are beans shelled out before the pods dry, then dried. They cook without the soaking needed by beans from dried pods. Half-runner beans have runners 3-10 feet long. Their popularity led to commercialization, which sadly included the tough gene being incorporated into the seed line (to withstand mechanical harvesting without breaking). It is hard to find non-tough half-runners now. Stringless bush (or bunch) beans are all I grow. These old-timers are sure stringless beans have less flavor. Modern stringless beans have to be picked before the seed appears, because they include the tough gene. The downside of stringlessness is toughness – what irony! People who grew their own beans developed varieties for each growing season: ones with good cold soil emergence for spring, ones for hot summer months, shade-tolerant ones for growing in cornfields, and fall or October beans that do well going into cooler weather. Some beans are named after the time of year they are planted, others after one of the people involved in growing them. Some growers would trade their bean seed at the local hardware store for other seeds or for supplies. So hardware stores, rather than feed stores, were the place to buy local heirloom seeds. The author discusses the cultural context that has made the Appalachians a fertile ground for maintaining heirloom beans. Families farmed to support themselves, and survived and thrived according to their talents at producing food, and products to trade. During the Great Depression, beans were a very important source of food. The author takes us on a tour of several farms and their bean varieties. “Haywood County’s past can be found in more than old records and photo albums. Try the bean patch.” As more people discover the flavors of heirloom varieties, demand and enjoyment is increasing. Unlike beans, tomatoes were not prominent historically in the diet of Southern Appalachian people, but they came to be important and an enormous range of flavors, shapes, sizes and colors has been developed. There are at least 34 sugars and acids involved in tomato flavors. Many people have heard of Radiator Charlie’s Mortgage Lifter, but few know the Vinson Watts Tomato, developed over 50 years of careful work. The author has grown this tomato and 450 others during a 49 year period, and reports that this is the most disease-resistant he has found, with no compromise on flavor. It’s available from Southern Exposure Seed Exchange. After 20 pages on tomatoes, there are short sections on heirloom apples, cucumbers and milling corn (the US became dependent on hybrid corns and in 1970 the Southern corn leaf blight devastated 15% of the corn crop. Much of the genetic diversity and resilience had been lost). Candy Roasters are the type of winter squash most favored in the Southern Appalachian Mountains. Little known elsewhere, this big storage squash (which possibly originated with the Cherokees) is used for pies, breads, butters, generally with sugar. Next we dive into the last third of this book: stories about individual seed savers the author met or corresponded with. This is the ethnography part of the book – a descriptive study of this particular human society. The farmers and gardeners here are of the older generations. Seed saving seems a very life-enhancing activity! The final photo is of 100-year old Judith Whitehead Patteson, sitting outdoors, holding a jar of Ardelia’s Speckled Butter Beans, which she has grown for many years. Read this book for an inspiration into the difference it is possible to make, by choosing good vegetable varieties, growing your own and buying local.